It was a giddy day in the PoldaPop household yesterday. 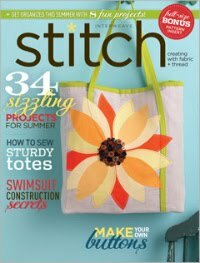 I received a copy of the Stitch Summer 2013 magazine that contains my first published project! Lisa Polderman??! Who is she and what does she do, you ask? You can check out some of Amy's other creative projects on her blog and in her Etsy shop, form*work. She has some adorable screen-printed tops. I am ashamed to admit (although not ashamed enough to hide it) that I carried the magazine with me to the girls' dance class at the Park District and then to a PTA meeting in the evening just so that I could share my giddiness. Ah, a good day! 7 comments on "Live, In Print!" That's awesome, Lisa! You didn't even say, you sneaky lady! Thats is really some juicy and great news :) Congratulaaaations !! !